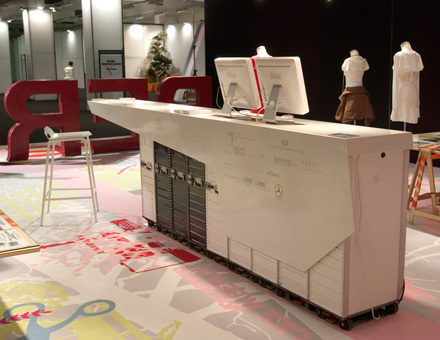 Special Exhibition of Berlin Fashion Design at the Milano Moda Donna 2006. On initiative of the German Ambassador to Rome, the german capital, awarded the title “City of Design” by the Unesco, presented itself at the renowned international Fashion Fair “Moda Donna” in Milan. 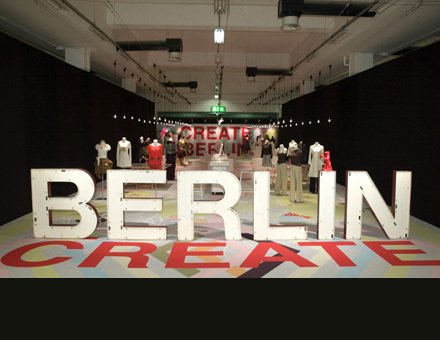 The main idea of the exhibition was to show Berlin for what it is: an open, creative trend workshop for the fields of Fashion and Design. 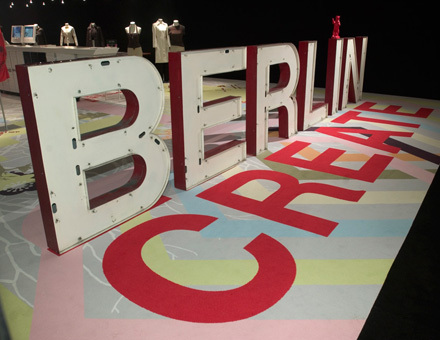 For this special exhibition with outfits of young and upcoming Berlin Fashion Designers, Coordination, a founding member of “Create Berlin e.V.”, has conceived a dynamic presentation landscape. 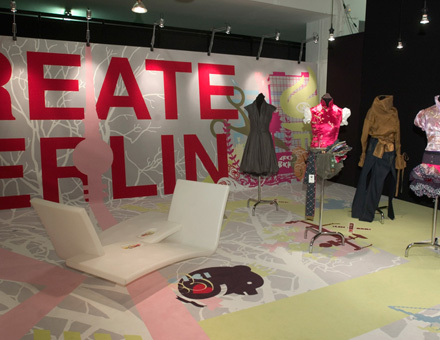 A carpet with playfully interlaced Berlin Icons, created by the Graphic Design Studio “substrat”, invites on a journey of visual discovery over a 250 sqm graphic area. Studio tables with personalized descriptions of the designers grant insights into the creative minds behind the outfits. On the opening day, the exhibition was accompanied by a large scale fashion show of the current collections of the Berlin Fashion Designers Lala Berlin, 30 paarhaende, von Wedel & Tiedeken, Macqua, Presque Fini, c.neeon und Sisi Wasabi.